Mental illness truly is a burden on one's physical, emotional and mental health. It obscures your perception of yourself, others, the world and life in general. A common complaint is "What is the point?" What is the point of continuing in the dark tunnel when you can't see the light? What's the point of fighting if all you're going to do is wake up and continue fighting? What's the point of living if things are just going to get worse? What is the point. Mental illness blurs your vision and you're no longer able to depict what life used to be like or could be like without the suffering. The illness becomes your entire world, and you lose hope, become unmotivated and most of all unhappy. If there was no bad in the world, what value does the good hold? Life will always hit a low point, not because of you, not because of your choices or because of your character. No matter who you are or what you've done, there will always be a low point in life - and there most certainly will be very many indeed. But we forget that this is what life is. Life has good and bad. So why do we blame ourselves or other influences when things go wrong? Life will throw everything at you, life will have dips, life will be unfair. But you have the power to change that. See the good in the bad, and you'll soon see a lot less of the bad. It's all about perception and you have the ability to change and shift your universe to what ever you see fit. When you concentrate on the bad, you see bad in the good, and soon you'll lose your harmony and balance. People rarely understand the importance and power of positive thinking. Seeing the Good in the Bad can and will change your life. I no longer see mental illness as a burden, instead I'm forever grateful for it. Without my suffering I wouldn't be me. Without my struggles I wouldn't be here. I wouldn't have the opportunity to help others or meet all these incredible people. Our struggles have united us. Our dedication to help others and seek help is all derived from a common pain. 7 Cups has been founded because of people like us. Without us, 7 Cups and many many other incredible organizations wouldn't have come in to existence. We have truly changed history, our existence has an influence. And this just proves how essential each and every individual is. Live life for the good, bad and the absolutely amazing. The pain only makes you treasure the happiness so much more. And it's the people who have truly suffered who know what happiness truly is. It is the people who had nothing who know what the value of wealth is. It's the people who make mistakes who understand the meaning of success. It's the people who've hit rock bottom, that know how to get to the top. It's the people who were beaten down and wounded that were the strongest ones as they got back up and continued to battle. You are warriors. You are survivors and you are fighting an internal battle. Never lose sight of what's important. Put your hand over your chest, feel that? It's called a purpose. You are here today because you are going to influence this world. Truly the world would not be what it is without you, nor will the future. Your existence has changed the past, present and future of the planet permanently. Never give in and never give up. Usually the moment you're at your breaking point, and ready to give up is the moment right before miracles happen. You will never reach a point in life where it will be only happy days. Life will always get better, get worse, become mundane but overall turn out to be spectacular. Maybe miracles have become so common that we now see them as ordinary. It's important to realize the true beauty of the world and understand your true capabilities. You're an intelligent being with the ability to contemplate, wonder, question and find answers - how incredible is that? I don't know about you, but I think every single living person is a miracle. You all have the ability to make a difference. Every day you're granted life is truly amazing - even if they are common occurrences, they still are extraordinary to me. 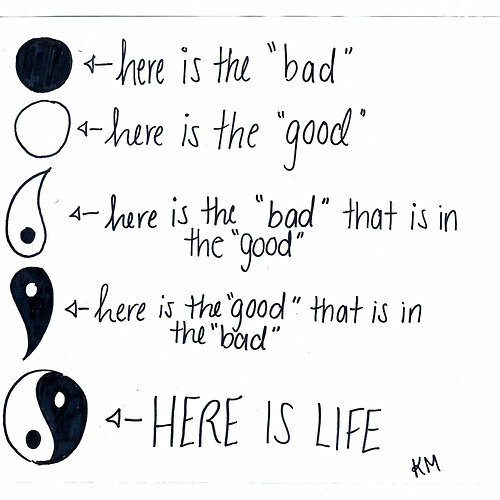 So see the good in the bad. Because the moment you see the beauty in life, is the day you set yourself on the road to recovery.